When you have more podcast episodes than your RSS feed holds, it can affect your audience, marketing, and more. Here are eight options to fix it. With these things in mind, you can determine which of the following options are best for your podcast and, most important, best for your audience. There is no universal hard limit to how large an RSS feed can be, neither in its file size nor in its number of episodes. There are, however, practical limits, as I discussed in my previous episode, such as the speed and compatibility of large feeds. Most podcast-feed-creation tools default to 10, 20, 50, or 100 latest episodes. If you have more episodes than that and you want them to display in podcast apps and be downloadable by your subscribers, then you should raise the limit in what is creating your RSS feed. Even if a podcast directory limits the number of displayed episodes (such as the Apple catalog's current limit of 300), you can increase your number of episodes beyond that. This will make those older episodes still fully accessible to your subscribers, even if they don't display in podcast catalogs. 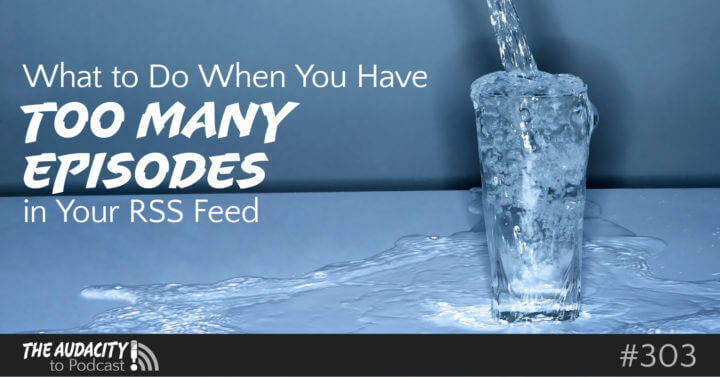 When you raise the limit on your RSS feed, it could add significant data to the feed, which could result in slower performance. Use a highly-optimized, podcast-only RSS feed that contains minimal data (such as a Libsyn feed separate from your website). Use “Feed Episode Maximizer” on your podcast-only RSS feed from PowerPress so it will reduce the amount of data accompanying older episodes. Make sure you use a podcast-only RSS feed for podcast apps and directories. Otherwise, including text-only posts in the same feed can cause unnecessary inflation and bump out podcast episodes from item-limited feeds. If your feed contains only podcast episodes, you might want to consider cleaning up your archive. Look for any kind of announcement-only episodes—such as for a hiatus, upcoming event, or special circumstances—which are no longer relevant. But I actually caution against this. There are certainly times it may be appropriate. But for most of us, our archive of episodes tell a bigger story that help build our authority and influence. If your content is timeless and you limit your feed to only your latest episodes, you may be able to sell access to your older episodes. You could do that through Patreon, MyLibsyn, or a membership system on your site (such as with the MemberPress plugin for WordPress). The Adam Carolla Show and Ben Greenfield Fitness are a couple podcasts that do this. Although you could sell individual episodes, I think it would be easier for you and your members, as well as foster an ongoing relationship, if you treat it more like membership access. This would allow them to pay a recurring fee to keep access to everything. But ensure the members-only feed does contain everything and has no limits! This would allow paying members to subscribe to that feed instead of your public feed, and then they will have access to all your old and new episodes from a single place, as long as they maintain their membership. Although an RSS feed theoretically has no limit to the number of episodes, podcast directories might (Apple currently limits it to 300). Thus, your old episodes may be available to subscribers, but not findable through search. If you want your episodes to remain findable in podcast apps beyond those directory limits, then consider creating one or multiple archive shows. For example, John Lee Dumas's podcast, Entrepreneur on Fire, is far beyond the 300-episode limit for the Apple podcast directory. His main podcast feed contains all his daily episodes, but only the latest 300 are findable through Apple Podcasts. So John creates and submits separate RSS feeds with 300 episodes in each: 1–300, 301–600, 601–900, and so on. This ensures his old but timeless content is still findable, which is especially important for popular guests or topics. John makes these separate feeds by creating additional shows on Libsyn. This gives each show full control over a dedicated RSS feed without having to use FeedBurner. It also provides separate archive stats. But this does cost extra for each new show. A big benefit to John's method of completely separate hosting is that he can edit those episodes differently to make each one encourage subscribing to the main feed. Thus, the more affordable and easier way to create archive shows is with categories—either in WordPress, Libsyn, or your other feed-creation tool. These categories could be named simply, “Archive 1,” “Archive 2,” and so on. With PowerPress, you can enable Category Podcasting to have full control over each RSS feed. With Libsyn, you would need to run the category feeds through FeedBurner—and yes, use the dreaded SmartCast feature—to have control over the feed data. Consider these archive shows a form of passive SEO. You don't have to promote them, but they are there and findable for anyone. You could simply do nothing and let your podcast episodes disappear after they're bumped beyond your limits—either by the podcast directories or by your own feed limits. This could be totally fine for many podcasts that lack ongoing, timeless value (also known as “long tail”) for older episodes. For example, episodes from a current-events podcast are no longer relevant after the current events have past (and possibly been forgotten). This could apply to podcasts that cover news, sports, day-in-history, and such. Limits aren't always a bad thing. So regardless of the timelessness of your episodes, you may decide to do nothing with your feed itself. But when you know your podcast's limits, you can make decisions that help you to podcast better within those limitations. Interested in improving and growing your podcast? Join the waiting list to be the first to know when Podcasters' Society is open to new members! Great info Daniel, I’m only on episode 15 of my podcast so will be a little while before I hit the limits but I had been wondering about how the long running podcasters and the daily podcasters deal with this. The Archive show and feed is an interesting approach. That’s probably what I’ll do when I get to that point. I think (and hope) that podcast search gets better over time both in iTunes and elsewhere so I think it will be valuable to have all episodes out there.